It's been eight years since the Huskers last met the Buffaloes on the field but this Saturday, the two teams will face off, reigniting a rivalry that dates back decades. One die-hard Husker superfan was there at Folsom Field in Colorado during Nebraska's win over CU in 1995. Twenty-three years later, Jim Buchanan will be in the stands at Memorial Stadium hoping to see another win for the Huskers and re-create a now-infamous photo. Buchanan was snapped outside Folsom Field cheering on the Huskers with a license plate reading "Beat CU." 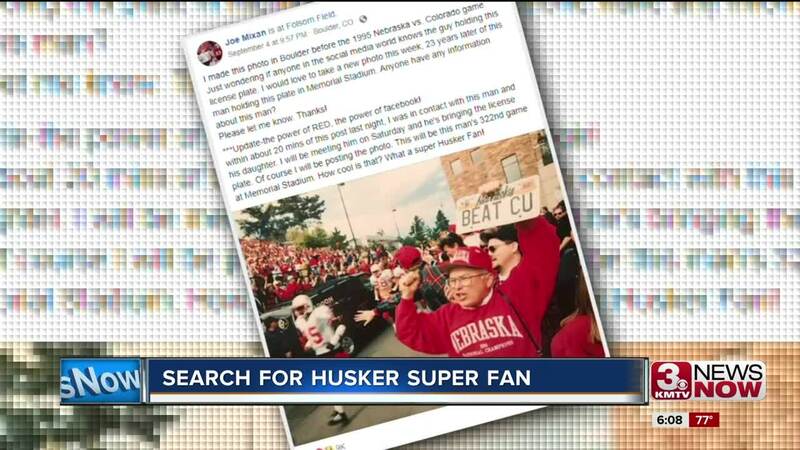 The photographer behind the photo, Joe Mixan, uncovered the snapshot in his old archives and posted it to Facebook asking for the public's help in identifying the mystery Husker fan. In less than 15 minutes, devoted fans were able to identify Jim Buchanan as the man in the photo and connect the two. On Saturday, the pair plan to recreate the original fan photo outside Memorial Stadium with the same license plate in hand. Saturday's game will be Buchanan's 322nd home game. He has also attended more than 60 away games and only missed a handful of games in 46 years.